Fiction – paperback; Penguin Australia; 240 pages; 2010. Reviews of Thea Astley’s novels on this blog are like buses: none for ages, then two come along at once. 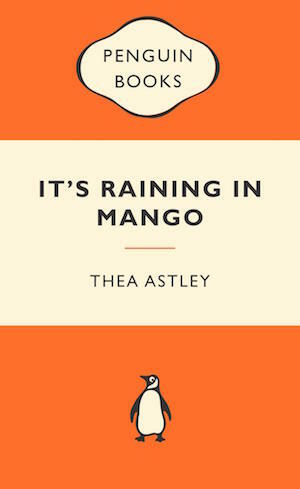 First published in 1987, It’s Raining in Mango was Astley’s 10th novel. It tells the story of five generations of one family — from the 1860s to the 1980s — and touches on a wide variety of issues, including racism, sexism and homosexuality, all within a distinctly colonial Australia framework. As ever, with most of Astley’s novels, it does not make for easy reading, but it will reward those who persevere through at least the first 60 or so pages. The book’s unusual structure makes it a challenge to read. Instead of telling the story in chronological order, Astley complicates matters by constantly jumping between generations and sometimes letting time frames overlap. This does not make for a straightforward read and requires some effort on behalf of the reader to make things “work”. Fortunately, there’s a helpful dramatis personæ at the front of the book, which provides the birth and death dates of each character, including the circumstances of their death. Without this I’m afraid I would have been totally lost. The structure is also more akin to a collection of short stories (it won the inaugural Steele Rudd Award, a literary prize for short stories, even though it’s not branded as such) rather than a novel (a trait shared with her 14th novel Drylands), but the interconnections between characters means that it feels like a cohesive whole. This brutal, honest reporting results in him losing his job — and so sets into motion the cycle of incredible ups and downs for the Laffey family over the next 120 years. During the course of this “novel” (I use the term loosely) we meet a wide variety of characters, most of whom are struggling to keep their heads above water, including Cornelius’ wife, who runs a pub, their son and daughter George and Nadine, and their respective partners. Their individual stories, told in separate chapters, are gritty, often heartbreaking and sometimes violent. Nadine, for instance, has a child out of wedlock when she is 14 and ends up working in a brothel to support herself. It’s Raining in Mango — the title refers to an imaginary town called Mango in tropical Far North Queensland — also covers the history of an Aboriginal family, whose lives occasionally intersect with the Laffeys. This serves to remind the reader that while things may never be smooth sailing for the Laffeys, things are a lot worse for the Mumblers who have suffered violent dispossession at the hands of white settlers. What emerges is a portrait of Australia’s hidden history: of strangers in a strange land trying to make a go of it, and its native inhabitants being massacred in the name of colonial “progress”. For a much more intellectual — and insightful — take on It’s Raining in Mango, please see this article in the Australian Book Review. This is my 49th book for #ReadingAustralia2016 and my 32nd for #AWW2016. *smacks forehead* You’ve done me a favour, my friend, I’ve had this on my TBR forever, but never bothered to pick it up because I thought it was short stories…. Well, it *is* short stories but because it’s all about the same family it could be described loosely as a novel. I can’t say it’s a format that particularly works for me, but I like the fact she writes about issues often swept under the carpet. In terms of writing about Aboriginal massacres, I think she was waaaaay before her time. Yes, I think so too. Part of a wonderful generation of women writers here; we will not see her like again. Coincidentally, my next post is on Steele Rudd including how he was persuaded to make up his initial bush stories into a more novel-like form by attributing them all to the same family and giving them some continuity. These two reviews have inspired me to do something about the long unread Astleys on my shelves. I’ve been fascinated to read your posts about Astley, particularly now as I’ve been gifted a very interesting sounding biography of her. Which of her works would you recommend as a starting point? I’m probably not the right person to ask as I find her work difficult and the stories just don’t stick with me. Mind you, I’ve only read three, so perhaps I should persevere with more in her backlist. The biography would probably be more interesting for me: it might give me a better handle to understand her work.